Most of my clients want to update their WordPress sites themselves. 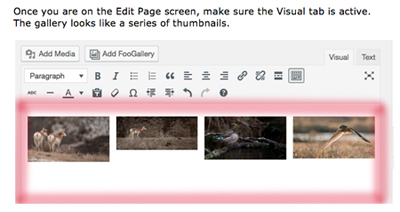 In addition to editing text or writing blog posts, they may want to edit their image galleries, add new pages, or edit their navigation menu. Once I publish a website, I create a custom User Guide to walk my client step-by-step through the editing process. Each User Guide is unique, because each client’s needs are unique. I start from the beginning, showing them how to log in to WordPress. From there, I’ll write custom sections for each type of edit the client wants to make. Each instruction is accompanied by an annotated screen shot illustrating that step’s actions. My background before I was a web designer was as a technical writer in the software industry, so writing these guides is a lot of fun for me. Once I give a client a User Guide, I rarely hear back from them. I check the site from time to time and see that they have been keeping it current. To set them out on their own, like a bird out of their nest, is one of my greatest rewards.